Academy Award®-winning filmmakers Ron Howard and Brian Grazer (A Beautiful Mind, American Gangster) join forces with Grammy®-winning superstar Shawn “JAY Z” Carter to create Made In America, an electrifying and inspiring behind-the-scenes documentary about last year’s multi-genre Budweiser Made in America music festival in Philadelphia. 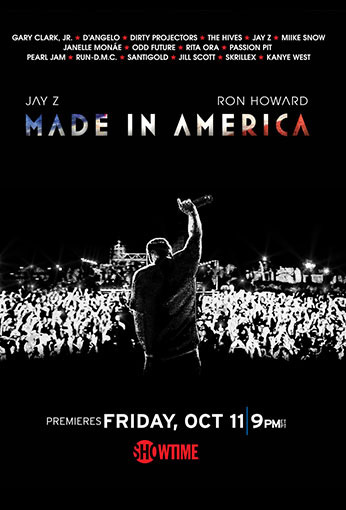 Featuring thrilling live performances by D’Angelo, Dirty Projectors, Gary Clark, Jr., The Hives, Janelle Monae, Jill Scott, Kanye West, Miike Snow, Odd Future, Passion Pit, Pearl Jam, Rita Ora, Run-D.M.C., Santigold, Skrillex and JAY Z himself, the film offers viewers an all-access backstage pass, as Howard and his camera rove the festival grounds speaking to the artists, music lovers, vendors, stage hands and neighbors who came together to make Budweiser Made in America a one-of-a-kind event. The result is an insightful, poignant and uplifting exploration of the state of the American Dream set to an infectiously eclectic beat.